What's the deal with getting on these "special distribution lists?" This pitch about “Federal Rent Checks” has been circulating for quite a while, and it’s still being mailed out with a July 2018 date under the signature (I got a few questions about it just this week), so I decided to take a second look. And what do you know, there has been a LOT of change in this particular investment being teased since I covered it when those ads started rolling in July. So the ad hasn’t changed, but I have some updates for you anyway. I’ll leave the original assessment in place, and then provide you some updates at the end. 7/23/18: This ad is one of so many that make me grit my teeth over the “checks” that “everyday Americans” can easily “claim” to receive thousands of dollars a month… they’re all technically true, but they omit so much that I’m sure folks who can’t afford to get sucked into this silliness end up losing money. And then some language that starts to make it seem like, hey, maybe this crazy idea of me getting free checks could be real! “You already know that it’s your tax dollars paying for each building and facility being used by the DOJ, CIA, NASA, FDA, Congress, and even the White House. Right, so that’s MY White House, yes? I get to charge rent on it! This is starting to sound possible, yes? “Currently, over 100 federal agencies are required by law to pay rent for the properties they occupy. “This cash is flooding into the Treasury Department, where it’s being stockpiled in the Federal Buildings Fund. “This year it will have $11.1 billion in it. “It’s an enormous, $11.1 billion pool of money. “And some very smart Americans have discovered an investment that allows them to tap into a large portion of it. See what they did there? Use an insanely huge number ($11.1 billion) and then talking about a “hefty check.” Which word gets downplayed? Investment. So yes, this is not a free check you get in the mail because you’re a US citizen and your forefathers helped buy Columbus, Ohio… this is an investment. As you’d expect from, well, an investment newsletter. Though, of course, the emails introducing the ad don’t use the term “investment” at all… that comes later. What’s the actual newsletter being peddled? It’s a little complicated, but they’re primarily selling D.R. Barton’s 10-Minute Millionaire Insider, which seems to be focused on technical trading and options as well as on higher-income investments. It’s a relatively low-cost letter, they offer it at $79 for the first two years, but also throw in a one-month trial to Private Briefing, another of their newsletters that after a month will renew at $99… so if you sign up and don’t pay attention or cancel anything, you’ll end up eventually paying $178 a year. You’ll probably see lots of other prices bandied about, they tend to test price points pretty aggressively in different promotions. “… it turns out some folks have uncovered an ingenious way to exploit Uncle Sam’s rent situation. “They’ve figured out how to add their names to a special distribution list. But yes, as with every single email ad that promises you that you can “enroll” or “sign up” or “put your name on the list” for some particular checks that will come flowing your way… the word they should be using is “invest”. These checks are returns on your investment, in pretty much every case… as is said so often it sometimes gets ignored, “it takes money to make money.” The person who collects the most rent is the person who owns the biggest chunk of the building. Still, we think, those checks… maybe they’re really “hefty?” What does “hefty” mean, anyway? “And they can be quite large. Which is true, of course, $1,795 a month is nothing to sneeze at… but that’s not the amount you get if you just “sign up” with one share. And they reiterate many of the arguments that are often made about the special “checks” you can receive if you only join this newsletter and “sign up” … how it’s better than Social Security because there are “no restrictions” on who can “sign up” … but what they really do is keep punching that hot button (for anyone who’s close to retirement) and mentioning those monthly checks. “‘Federal Rent Checks’ are issued around the second week of every month, January through December. “And by implementing a simple strategy, you can collect them every month! “Brad Thomas served as an advisory board member for President Trump’s original campaign. “He compared the ‘Federal Rent Checks’ that folks like John, Bonnie, Simon, Al, and Lindy are collecting to printing money. So that’s enough of my huffing and puffing about the language in the ad… this is an investment they’re teasing, so what is the investment? It’s all about government buildings — or, more specifically, the buildings that are leased by the government. Naturally, like any other business, when the government needs more office space they have to rent it — they do occasionally buy buildings, but more often the government does what it always does… rent instead of buy, because that makes the current financials look better. “Altogether, the U.S. Government is legally required to pay rent for 9,600 federal buildings this year…..
“It takes about 10 minutes to set up. “You can even use your cell phone to get started! “Each of your ‘Federal Rent Checks’ could initially be made out for $1,795. “But over time those checks could be worth much, much more. I’m afraid it’s just as simple as you’re imagining: You buy shares of a Real Estate Investment Trust that owns government buildings, then collect your dividends… it’s those dividend payments that D.R. Barton is calling “Federal Rent Checks.” And the “special strategy” he cites is… buying more than one such investment, because then your dividend checks come more regularly (most REITs still pay their dividends quarterly, but if you own a bunch of them you might time it to get a check every few weeks). For those who are unaware, REITs are Real Estate Investment Trusts — they trade just like regular companies on the stock exchange, but they are pass-through businesses when it comes to taxes — they don’t pay corporate taxes, and in exchange for that tax exemption they’re required to pass through at least 90% of their income to shareholders in the form of dividends (with the assumption being that you’ll pay taxes on those dividends, so the tax does eventually get paid). And yes, for most REITs the dividend payments will increase over time — that’s one of the major appeals of real estate investment, rents increase over time with inflation, so if the company manages its buying and selling well and doesn’t pay too much in overhead costs, they can increase the dividend as they raise rents. “Down the Road You Could Be Paid an Enormous Lump Sum to Transfer the Rights to Your Federal Rent Checks. No trick there… if you want to “transfer your rights” to receive these dividends, you just sell the stock. If it’s worth more when you want to “transfer” in the future, then you’ve made some money (REITS do not only go up in price, of course, just like stocks do not only go up… so you could lose money, too). So which ones specifically are being talked about? Well, there are a bunch of REITs that have occasional government tenants, mostly office REITs (the government, after all, is nothing if not a major employer of buildings full of office workers), but there are just two who are really focused entirely on being “Uncle Sam’s Landlord” (OK, they rent space to local and state governments, too… but mostly the Feds). The one that is most often teased is Government Properties Income Trust (GOV), and the smaller upstart is Easterly Government Properties (DEA). And not a lot has changed about the story for these two over the past few years that GOV has been relentlessly teased by one newsletter or another (it was pitched for a long time as a way to earn monthly checks from a “little known Social Security contract,” since the Social Security Administration is one of its larger tenants), but it has also been touted as a way to “earn an extra $1,003 in benefits” or “tax back the government”. Really, the only thing that has really changed in recent years is the share price — in the past three years the price of GOV has dropped 14%, and the price of DEA has risen 23%. GOV pays a very high dividend but has not been able to raise the dividend in many years, and DEA pays a lower but rising dividend, so the total return has been positive for both — GOV has returned 11% in three years including the dividend, DEA 43%. (That was the story in July… nine months later, not so much — from that same July 2015 start date GOV has now lost 43%, including dividends, and DEA’s total return is down to a positive 37%). But now it’s time to step in with our March, 2019 update… because it’s not GOV anymore, it’s OPI. Government Properties Income Trust (GOV) merged with another REIT that is also externally managed by the RMR Group, Select Income REIT (SIR), and changed its name — the company is now Office Properties Income Trust (OPI), and the shares were consolidated 4:1 (meaning that if you owned 100 shares of GOV last year that has now become 25 shares of the new company). All of this happened right at the close of 2018, so the year started fresh with this new company and new share structure. Back near the time this ad was first written last year, by the way, you could take “one Alexander Hamilton and one George Washington” and buy a share, as teased, meaning a single share was close to $11 for a while. A further match for the clues, but that doesn’t help so much — you would have exchanged four of those shares you bought for $11 each, if you bought near what seemed for a while like the bottom, so your effective cost is $44 per share now, and those shares now change hands at $28. GOV was always promoted on the basis of the safety of having government tenants, and the unusually high dividend yield that the shares gave you for much of the past several years, often in the 8-11% range, which is high for a “traditional” property-owning REIT (most of the super high-yield REITs these days are actually highly levered mortgage REITs that own portfolios of mortgage bonds, not actual buildings, and are largely interest rate-arbitrage investments). As of the last quarter, there was no sign of acceleration or improvement in operations that I could see. The lease renewals in that quarter were at lower rates than the tenants had previously been paying (7.8% lower), and the occupancy was 91%, which was also down a little bit (from 93.3% a year ago). The financials are going to be dramatically colored by the merger and by asset sales for the next year or so — GOV had bought a competing company back in 2017 as well, and part of the plan to deleverage from that acquisition involved a sustained period of selling properties, which is still happening… and the SIR merger also led to putting 34 properties up for sale so far this year. The financing in recent quarters also got pretty confusing, with GOV selling the SIR shares it owned back in October in an underwritten public offering that they used to pay down some debt (selling the SIR shares was part of acquiring SIR, in effect, which sounds dumb but I guess generated some cash). It was that high dividend yield that attracted investors, I’m sure, despite the weak-to-flat share price performance (there are lots of folks who will buy a 8-12% dividend payer and be delighted with those recurring dividend payments, even if the total return is abysmal), and that’s no longer available… which is probably the primary reason for the dramatic fall in the share price since last summer. If you had bought 100 shares of GOV last summer at, say, $15 a share (that’s about what it was when we first covered this ad in July), that would be an investment of $1,500 and you’d receive $43 per quarter in dividends (43 cents per quarter, $1.72 per year per share, a huge yield of 11%)… those 100 shares turned into 25 shares of OPI, today worth a total of about $700 (at $28/share), and you will now be receiving 55 cents per quarter, or $2.20 per year in dividends. That looks on the face of it like an impressive amount per share compared to last year, but you have only 25 shares now so the quarterly cash received is down from $43 to $13.75. The current dividend yield, for people buying today, is still pretty huge at 7.8%… but for folks who bought GOV last summer their yield on the cost they paid for their shares is now down to 3.6% ($55 per year on a $1,500 investment). I imagine the folks who bought this for income back then are probably pretty mad. They have done what they set out to do, though, in terms of resetting the dividend to a sustainable level… they just weren’t all that clear in announcing what a massive cut that would be. So the positive spin is that they’re no longer paying out essentially all of their cash flow (sometimes more) as dividends… and though they still have a huge amount of debt, some of which they’ll be paying down this year as they sell more properties, the reset does give them a lot more breathing room on cash flow. They might even start to grow the dividend from this much lower level, which could attract a new group of investors (the dividend had previously been flat for years, since they couldn’t afford to raise it). The question is what the business looks like going forward. Things have gotten a little bit worse operationally, in terms of vacancies and lease renewal rates, and the recent trend has been the government trying to cut office costs somewhat or consolidate its offices, which has been something of a drag, but we don’t really know what will happen in the future. They have about 11% of their lease income due for renewal this year, which is a little on the big side but not dramatically so. And I haven’t seen an overall breakdown of the tenants, but the merger with SIR brought in a lot of non-government tenants to diversify things a bit — so at least 25% of the tenant base is now private, neither state or federal government, though a lot of the tenants are large companies who can presumably pay their rent just fine (Northrup Grumman, F5, Noble Energy, Bank of America, PNC Bank, Allstate are a few). As of the last quarter, they were losing quite a bit of money but big chunks of that had to do with the SIR merger and with their shareholding in their manager, RMR… their normalized funds from operations (FFO), which is one way they express the earnings power of their actual properties, was $1.56 per share for the fourth quarter (assuming the combined company), or $1.03 if you include the incentive management fee that SIR owed to RMR (and which OPI did pay following the merger). They have given no guidance for 2019 that I’ve seen, but for that one quarter then that means they’re paying out only about half of FFO as a dividend (55 cents/quarter). That’s likely to be easily sustainable if the core of the business continues to perform OK.
And we probably shouldn’t annualize that odd number, but if we did then their normalized FFO for a year now would be around $4 per share, roughly half of 2018’s level, and that would mean the stock is trading at about 7X “normalized FFO”. Not to be counted on as a real number, since “normalized” is a very squishy term for a company that’s going through this huge upheaval with mergers and asset sales, but it gives some context to the valuation relative to the rental income they receive, and provides a little bit of confidence. The other little oddity here, if you’re interested in researching OPI, is that they’re externally managed — their management is provided by the RMR Group (which is also publicly traded, ticker RMR) in exchange for that management/incentive fee. That’s not entirely unusual — externally managed REITs just pay a management fee instead of having employees — SIR was also a RMR-managed REIT. 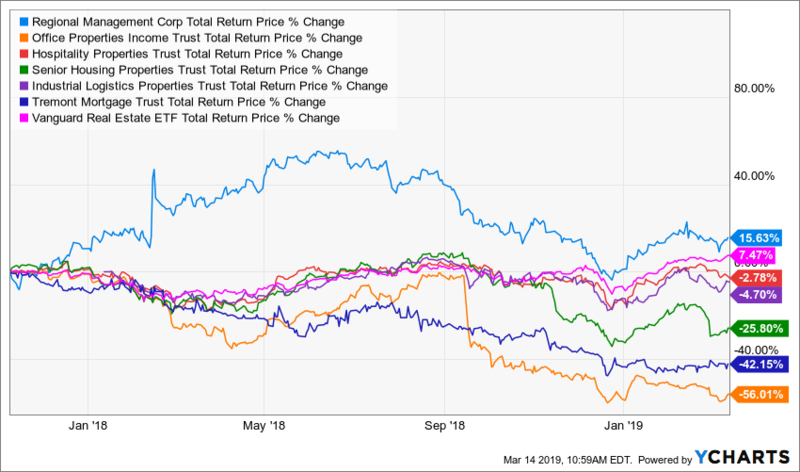 I’d generally prefer to own a REIT whose management team is entirely focused on making that REIT specifically successful, rather than an externally managed REIT which shares leadership with a handful of other real estate companies… and really, when you look at the past performance you can see where the value has accrued — not to the folks who own the properties and collect those “Federal Rent checks”, but to the company that manages those REITs. I’d have a hard time getting excited about either Easterly Government Properties, the remaining “mostly government tenants” competitor, or OPI these days… but there is something to be said for the value of the “reset” of the company, the much lower dividend and the deleveraging they’re planning to finish up as they sell a lot of buildings this year, so I can see the potential that they could start to become a growth REIT late in 2019 or in the coming few years, growing the dividend again and looking for accretive acquisitions. It seems likely that they’ll keep focusing on large buildings with single tenants, so that will be mostly government and huge corporate clients, which should make the default rate on their leases pretty low… though those huge tenants probably also have a lot of bargaining power for the properties that aren’t Class-A city center buildings. So it’s still not a situation I love, these RMR REITs give me a bad taste in the back of my mouth, but at this price I’ll keep an eye on OPI and will probably look into it more to try to figure out what their financials are likely to look like once they get “normalized” in a couple quarters, this is the first time I’ve looked at the stock in years and conclude that it’s valued at a level where I could take it seriously — a sustainable 7.8% dividend that might be able to grow is a lot better than a risky 11% one. I do always like to refer back to those “checks” they cite in these ads and do the math, to illustrate what kind of investment they’re talking about — they say that you can start collecting “as much as $1,795 per month”, and I’m pretty sure that’s the lowest number they cite for ongoing “checks”. What kind of investment would be required for that? Well, last summer I figured that if you were just talking about buying GOV shares, which are very high-yielding (and therefore the easiest way to boost that “check” amount, relatively speaking), their dividend was 43 cents per quarter, per share. That’s per quarter, not per month, so if you want to get $1,795 per month you’d need to get a quarterly dividend of $5,385. If we round down a little bit, then to receive a quarterly dividend of roughly $5,300 you would have needed to own about 12,500 shares of GOV. At $15.68 per share today, that would cost you about $196,000. A fairly steep investment for those who are tempted by the overhyped promises of a $79 newsletter. Today that story is, of course, a little different. To get $1,795 per month from OPI dividends you’d have to buy about 9,600 shares of OPI. At the current price, that would cost you about $270,000. Certainly it’s true that REITs can compound their earnings, and you might turn a smaller position than that into a meaningful stream of income over many years — particularly if you don’t take your dividends in cash but instead let the dividends reinvest and buy more shares, increasing your stake… but there’s no magic to it other than the mathematical magic of compounding, which works best when it is allowed to work undisturbed for a long period of time. It takes time and a relatively steady stock for that to work, as we can easily see an example of in this very company — folks who went into GOV shares a year ago hoping for that compounding would have had their plans dashed by the 50%+ drop in the value of GOV shares as they merged and became OPI and slashed the dividend. And there are external impacts from things like tenant bankruptcies (probably not the US government, but they are trying to shrink their office footprint), or from rising interest rates (which can increase costs for borrowers like REITs, and also make bonds relatively more appealing than REIT shares for some investors). But it is, at least, quite a bit cheaper than it has been for most of the past decade… so that’s something. Of course, I said the same thing last July — it was cheaper than it had been in a long time back then, too… which didn’t mean it couldn’t get cheaper. My sense is that this painful reset in OPI shares is almost entirely dividend-driven. The stock has been bought by shareholders for the high yield for a long time, and I’m guessing that it will start to find buyers again now that it is falling enough to become a high yielder again at this much lower dividend… and the valuation certainly looks better than it did a year ago, with a more sustainable dividend payout ratio, though that doesn’t mean I’m sure it’s done declining. I come away thinking it’s worth watching and considering after this “reset,” though, which is more than I could have said a year ago. Your mileage may vary, of course, and I’m sure some of you have looked at these stocks before — perhaps you even own them. What do you think? Getting cheap enough to buy OPI here? Like that yield now that the dividend is more sustainable? Think things will start looking up for the government building owners, or office REITs in general? Let us know with a comment below (we’ve left the original comments from the first version of this story attached). 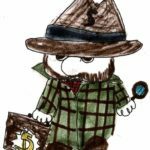 136 Comments on "Updated: Can Americans now collect “Federal Rent Checks?”"
Where the hell did I put my federal rent checks? May be my wife put them in the toilet with all newspapers to be used later. I guess conceptually it does, but this is just a REIT that owns office buildings and leases most of them to federal and state government agencies. Whether the rent money comes direct from the agency or through the centralized government procurement offices is not terribly important. Great article. You were the only one on the internet I could find who wasn’t trying to mislead. Knew it was too good to be true. I already have a REIT brings me $1,000 a month on a 200K investment. How does one get on the distribution list?? I have purchased some of the stocks but if there is a form to complete, I cannot find it any where- just a bunch of sites wanting me to buy their books. What did you do to get it. Do you mind me asking the name of the REIT? So Steven, that looks like approx a 6% annual return. Not exactly exciting, is it? $12,000 a year on a $200,000 investment is a 6% annual yield. Fairly typical for a REIT these days, even slightly on the high side (average is about 4-4.5% for REIT dividend yields right now). Eursel. if they were honest love. they would be skint and on the streets with a homeless sign. it is the deceitful actions that make the machine run. Without lies and deceit, the machine would come to a halt. and never start again. I want to be put our list, please ! Thanks for the clarification on this subject. Think it would be better for me to invest in precious metals. This federal rent checks program sounds like a scam to me where building owners get their property taxes paid by someone else. I don’t see that much of a return on investment with this setup. Then there’s the capital gains tax to pay on the interest and/or dividends. I’ll pass on this one. REITs are not scams, generally speaking, but they’re not miraculous money-generators either. REITs own the buildings and lease them out, and REIT shareholders own the REIT and receive dividends that rise or fall based on the cash flow generated by the leases. 1) It’s a sales pitch, alright! 2) Note that ticker symbol GOV was recently retired after a merger to now be ETF REIT ticker symbol OPI. The best REIT I own is NRZ. Currently pays over 11 %. Dividend has been very steady. Buy on pullbacks. Seeking Alpha likes this REIT. Like any investment do your due diligence before buying. Thank you so much for clearing up this SCAM. You cannot get something for nothing and yet these Internet sites claim you can. It really terrifies me when I read the comments on these sites about people wanting to sign up immediately, believing all the BS, without doing any research. Thank you so much for your concise and accurate information. With all these idiots/followers/believers whatever they hear, in the US it is no wonder that “Uncle Donald” is president. US Army Retired First Sergeant, 21 years. Yield is still above average, company is still pretty unappealing in my book. TECHNICALLY, I understand puts and options. I just cannot see taking a chance in a game where in order for me to win, the other fellow has to lose. Sometimes I might be the other fellow. At 56, I am like Will Rogers, more concerned with the return of than the return on my money. There is no distribution list, there is no free money — there’s just a REIT stock you can buy for a 7-8% dividend yield if you’re so inclined. Details in the article above. I’m a struggling single mom who lives paycheck to paycheck and is in debt up to my eyeballs. It seems one has to have money to invest money to make money. Can you do it a little at a time? You can definitely invest a little at a time, it’s easy to set up an automatic plan to invest $100 a month (or whatever) in a vanguard index fund. I wouldn’t dabble in individual stocks until you have built up a portfolio, if at all, but starting to get into the stock market can be easy and inexpensive. Always go to stockgumshoe.com with any questions or concerns about a potential investment. I have found timely and honest information, as in the “Federal Rent Checks” advertisement that has been reviewed above. Thanks. There is nothing to “sign up” for — you earn rent checks by owning property, in this case buying publicly traded REITs that own government-occupied buildings and thereafter receiving dividends paid by those REITs. Typically yields are 4-8% of investment at this point, which means that for every $1,000 you invest you’ll likely receive $40-80 per year in dividends.